Är "The keepers" Netflix nya "Making a murderer"? Redo för en ny true crime-besatthet à la ”Making a murderer”? Jag satt och botaniserade bland Netflix kommande premiärer när jag fastnade för den nytillagda titeln ”The keepers” – en dokumentärserie i sju delar om ”det olösta mordet på en nunna i Baltimore och de fruktansvärda hemligheter och den smärta som dröjer sig kvar nästan fem decennier efter hennes död”. The series opens with the story of Sister Cathy Cesnik, a beloved nun and Catholic high school teacher in Baltimore who went missing on Nov. 7, 1969. Nearly two months later, her body was found – and, to this day, her murder remains unsolved. The case returned to the spotlight in the 1990s when one of Sister Cathy’s former students – a woman only known as “Jane Doe” – came forward to share her experience of horrendous sexual abuse by the high school’s chaplain. Incredibly, “Jane Doe” revealed she was also taken to Sister Cathy’s undiscovered body and told, “See what happens when you say bad things about people.” Despite this and testimony from other victims and witnesses of abuse, no one was held accountable, and the story was largely unreported outside of Baltimore. Hur spännande låter inte detta? Sign me up! Återkommer med trailer så snart det finns en. 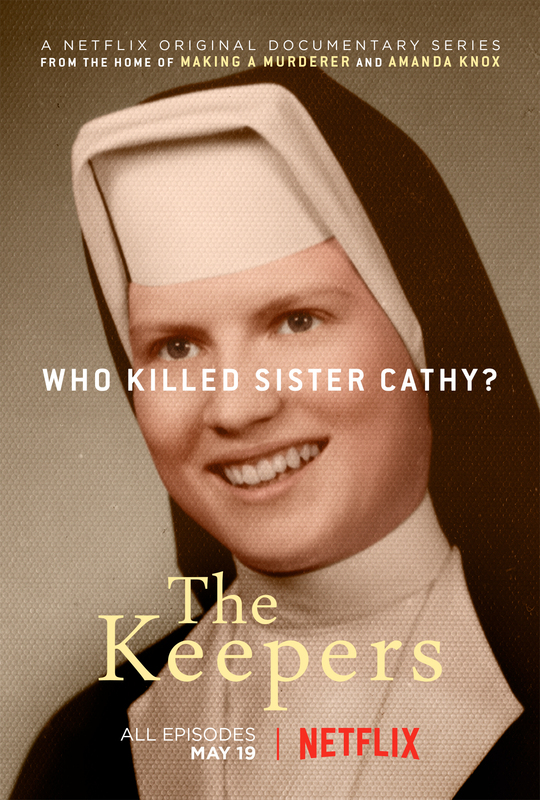 ”The keepers” har alltså premiär på Netflix den 19 maj.